Glass has gotten a bad rap over the years when it comes to furniture. Shoppers think of all the fingerprints, scratches, and fractures that can happen to their brand new dining table. With this fantasy in mind they often pass on the beautiful glass table for what they believe to be a more durable, wood option. The truth is glass can be one of the toughest materials, and survive any terror your little one (or rowdy party guests) will throw at it. High end furniture uses tempered glass in their pieces. Tempering is a process where glass is treated with thermal or chemicals to increase its strength three to five times that of non-treated glass. It creates balanced internal stresses which cause the glass, when broken, to crumble in small cubes rather than jagged shards. The pieces also are known to stay “together” instead of shattering all over the floor. Car windshields, commercial windows, and unframed architectural elements all use tempered glass due to it’s high safety characteristics. 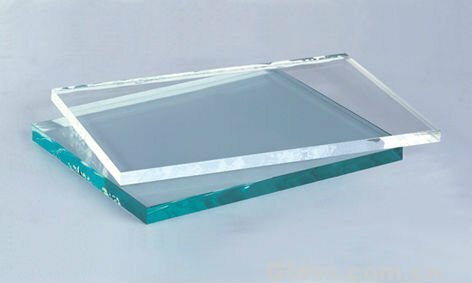 Many high end manufacturers are using Starphire tempered glass as well. Starphire contains as little as 10% of the iron content of regular glass. Thus allowing it to transmit 91% of light, compared to 83% for regular glass. This eliminates the greening effect that is typically associated with thick glass panels. It gives a true clear and white glass. Bottom glass is regular tempered glass. Top glass shows Starphire glass. Generally people worry about the maintenance of glass as well. 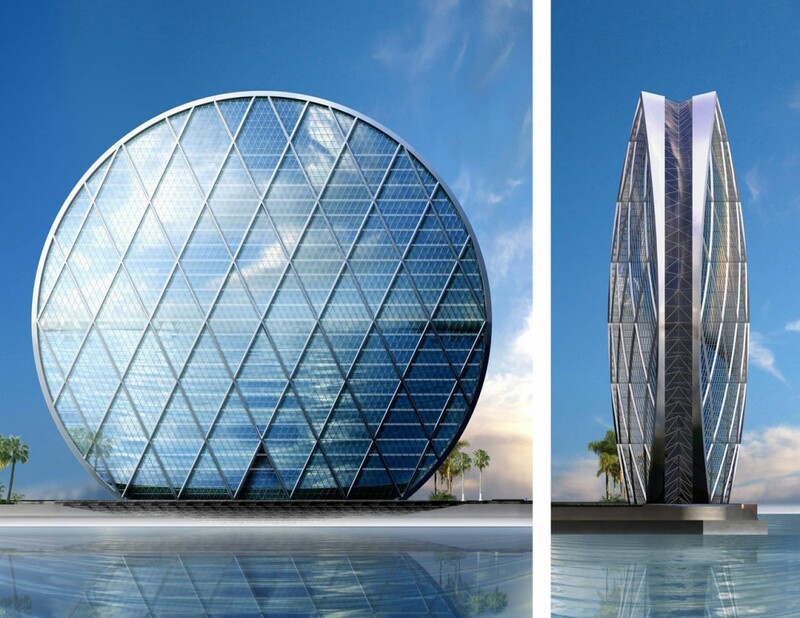 Manufacturers are doing some wonderful design elements with their glass, that also help the owner with less maintenance. BonTempi, an Italian manufacturer, is a perfect example. They design and manufacturer stunning glass dining tables, and other items. They have created several colors of paint that are baked onto the bottom of the tempered glass, and some they have combined with a “frosted” look as well. These colors and textures that are added to the glass hide finger prints and minor scratches. Leaving your furniture looking perfect. You have a table that can be maintained for years with a quick wipe down instead of oiling and polishing it every few months. Glass also has an added advantage over wood in thickness and weight. 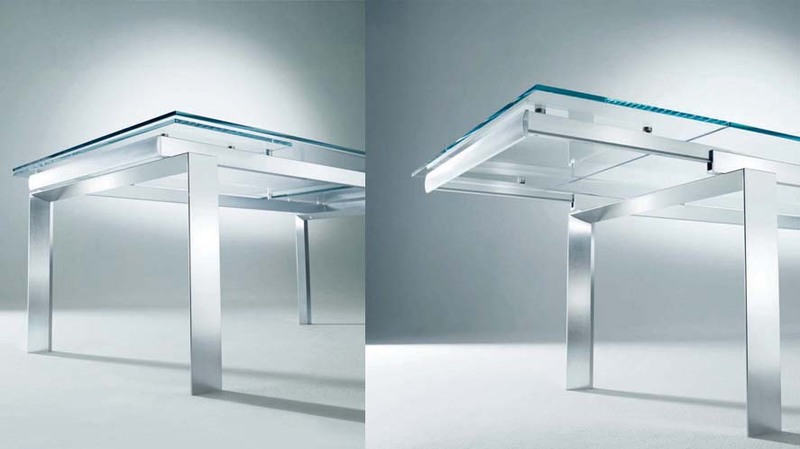 A BonTempi glass table that is 3/8” thick is light enough that extension leaves can be stored underneath the table top and lifted with special mechanics to fit flush with the rest of the table. Other materials would not be able to use this option as the thickness and weight would make it prohibitive. The malleability of glass as well opens the door for some beautiful designs. When heated a designer can mold glass into many shapes, with beautiful curves. BonTempi’s Label Table. Extensions leaves are stored under the table and lift to fit flush to the existing table top.